Macroeconomic news releases and events are something that every trader needs to adjust to. I would personally prefer if there were no news or sudden surprises but this will never happen, so we traders need to adapt. We, who take trading seriously and treat it as a business need to protect ourselves and adapt our trading strategies to the everyday macro news. In this article, I will show you how I personally handle trading macroeconomic news. In my early trading years, I was really attracted to trading the macroeconomic news. I thought that macro news releases were a great opportunity to make a lot of money quick. At first, I approached macro news from the fundamental point of view. I tried to predict the numbers as well as how the market would react. Sometimes I was right, sometimes wrong but in the long run, with all the effort I put into it, I found out that I wasn’t really able to find a clear edge I could use. In other words – I wasn’t able to find a profitable trading strategy that would be based solely on fundamental analysis prediction. As a result, I moved forward and tried to find a strategy that would be based on trading the macroeconomic news using only technical analysis. After I spent some considerable time and effort on this, I failed again. No matter how hard I tried, I wasn’t able to make a working strategy based on trading the news that would be profitable in the long run. The valuable lesson I learned the hard way is this: it is very difficult, maybe close to impossible to develop a working strategy that trades the macroeconomic news. You can be right few times in the row or have a good month, but in the long run, you might as well be tossing a coin. You will end up with around 50/50 strike rate at best. The end of the story is that I found my edge elsewhere, with volume using our Volume Profile tool. But still, I needed to adapt my strategy to the macro news as it is part of the trading business whether you want to trade it or not. A pretty funny thing is that now instead of trying to make money on the macroeconomic news I try my best to avoid the news. Now I quit my positions before the news, I don’t hold my intraday positions during significant data, and after the news is released I let the volatility drop down before trading again. Let me now give you a full description of my way of dealing with macro news described in 10 practical tips. You can use all of them or just let them inspire you to find your own way to deal with the news. You may also use the tips for your own strategy and your own levels, or you can apply them when trading using my intraday levels I publish daily in our trader’s forum. In my opinion, it is nearly impossible to predict the news – meaning the actual numbers and the market’s reaction to it. What is even harder is to predict the market reaction to the news. Funny thing about markets is that they always find a way to surprise you. Sometimes really good news is not as good as the analysts expected and thus the markets treat it as negative data. Sometimes there is surprisingly good news, but still, the markets react in the opposite way they “should.” There are many factors to consider, and we will probably never be able to see which factor outweighs the other ones, at least not before the news has passed and we have already seen the price move. Sure, we can tell the reasons the price moved after the news release (as most analysts do) – but obviously, this is too late and to no avail. My advice is – don’t try and predict the news outcome and the reaction to the news. Just put up with the fact that there are things you can’t predict and don’t have control over. It is easier to avoid this guessing game and instead concentrate on things where you actually have a solid edge. This is simply a must. You need to keep track of macro news releases every day. In order to be consistently profitable, you cannot afford to trade without being aware of all significant macro news that is coming up during the day. A good thing about the majority of the news is that the release dates are given way beforehand and also the release times are usually the same. What I personally do is check the Forex Factory webpage every morning and see what news is coming up during the day. I usually remember the strongest news and the times to avoid trading but to be 100 % sure not to forget anything, I check the news calendar at least once per day, usually before each trading session. If you are afraid that you will forget some significant macro news release, then you can also set an alarm to go off a few minutes before the release. Another way to keep track of the news is to use my TD Expert Advisor (available for members of my volume profile trading course). This EA can take care of the news, and it won’t let you enter any trades before or during the news release. Unexpected news is an unpleasant part of trading. Such news is part of the game, and there is no way to avoid it. More than once has the unexpected news caused me to lose a trade. Such news can be basically anything, but there are some that happen repeatedly. The most common are unscheduled speeches by central bankers, bank governors or presidents of world’s leading economies (currently the most unwanted unexpected news is probably caused by D. Trump on his Twitter). It can also be things like an act of war such as North Korea shooting missiles above Japan, or some type of natural disaster like a hurricane, earthquake, or tsunami. Use Forex Factory: If you see a sudden volatility spike in the charts, then check Forex Factory (“All News” section) for any new “red news” causing the spike or not. If you don’t see anything at first, then try refreshing the page few times as Forex Factory often has a few minute delay in publishing the unexpected news. If you see “red news” then it is best to avoid taking any trades until the situation calms down. If I don’t find any news to cause the volatility spike within few minutes, then I don’t cancel any trades or trading levels, and I trade as usual. Use FX Squawk: FX Squawk is an invaluable news service that informs you of any events with audio commentary in real time. To get it, you only need to register (for free) with FxPro (HERE). This service is really fast, and it is probably the best and fastest way to keep yourself informed. If there is any unexpected news, you can be sure that FX Squawk will inform you almost immediately. Then you only need to cancel your trades or adjust your trading to the unexpected news. Use TD’s EA: This is an expert advisor developed for members of my private trading course. One of the features it has is that it won’t allow you to open new trades if there is a sudden price spike or spread widening (which is usually linked to news releases). A good thing about the service Forex Factory and other similar websites provide is that they rank each news based on their importance. Forex Factory has three levels of news importance. The least important are yellow, then there is orange which represents medium impact news. Finally, there is the “red news” which is the most important releases of the day. I personally don’t really care about “yellow” (low impact) or “orange” (medium impact) news because this news doesn’t have that strong impact on the markets (except US governors speeches – those are sometimes significant, and I treat them like “red news”). They don’t usually cause significant spikes in volatility or anything else I should be concerned about. Because of this, I don’t mind trading during these release times of “yellow” and “orange” news. What I do care about is the “red news.” Those are the most significant, and I recommend avoiding them for the most part. However, the problem with red news is that some are redder than others. Don’t get me wrong, the color is the same, but the importance and possible impact of different red news can vary significantly. Being able to distinguish between various red news could appear not so important, but in fact, this knowledge can help you a lot. Why? Let me give you an example: There is a red news called “Crude Oil Inventories.” There is another red news called “Rate Decision.” Both are marked red as important news. The first one hardly ever makes any real impact on the USD while the other one is usually a start of a crazy ride that can last hours or days! 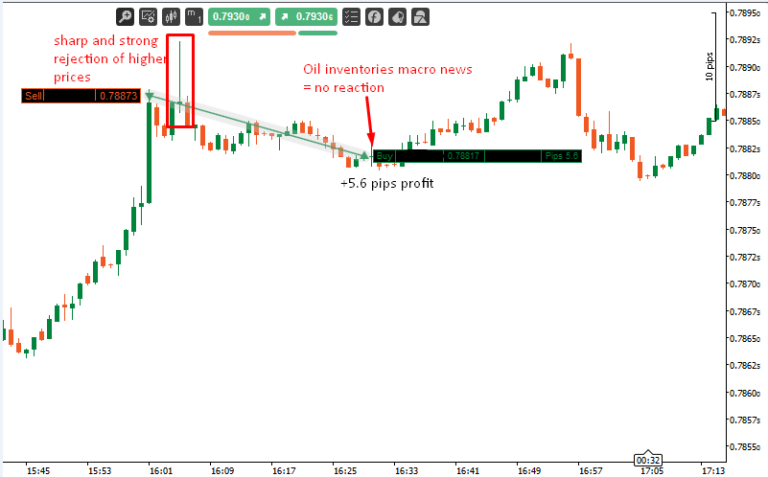 In my trading, I know that if the price doesn’t really move during the “Crude Oil Inventories” everything is okay and I can start trading again basically 1-2 minutes after the event.When there is “Rate Decision,” I know that I won’t be trading at least few hours after the news release and if the news causes a one-sided trend to develop, I definitely won’t be taking any levels that would go against this trend. I hope this illustrates that there is a clear difference between items marked red. To give you something to hold onto, let me distinguish the red news into three categories. If you feel like being aggressive, then you can hold your intraday trade even through such news. This news probably won’t cause any major volatility spike or sudden price change. If you quit your trade before this news, you can re-enter the trade quite soon (let’s say 1-5 minutes) after the release. 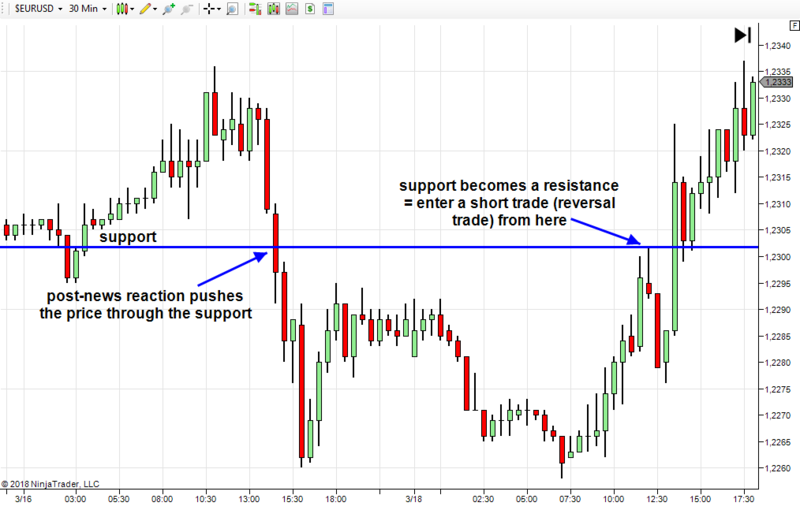 If your support/resistance level gets hit during the news, you can take it (if you feel a bit aggressive) or you can wait a bit and then take the trade few minutes after the news. I never hold my intraday trades during such news. Standard Red News have a considerable impact on volatility, spreads are usually widened, and there is a high risk of slippage. No matter how strong your support/resistance level is, this kind of news can start a trend which can shoot past your S/R and show no reaction at all. If the outcome of such a news event is surprising for the markets, then it can be a start of a new trend. It usually looks like one-sided aggressive movement that continues moving in one direction without any distinct pullbacks. In such a case it is best to cancel all your trades that would go against such a trend and rather trade “Reversal Trades” in the direction of the newly formed trend. This kind of news is capable of changing or starting daily/weekly/monthly trends. Not taking any intraday trades (or swing trades) during and after such news is vital. If there is a one-sided aggressive movement, then don’t attempt to catch the high or low and rather let the price shoot past your S/R zone and enter a Reversal Trade in the direction of the newly started trend. Still, you should really be careful and be sure that the first heavy volatility spike is over before attempting this. The reason is that during such strong macroeconomic events, all the banks and their algorithms are trading aggressively and the outcome of those first crazy moments is basically unpredictable. You should only start trading when the situation calms down and clears up a bit. If there is such a strong news then it is usually best to avoid it by stopping trading few hours beforehand and start trading again in the next trading session, or in the session after the next session – for example if there is FOMC meeting in the US session then you start trading again in the Asian session. If you want to be more conservative, then you won’t start trading until the EU session starts. There is a handy tool which is called “Economic News Impact Tool.” With this clever widget, you can easily check the historical volatility caused by any standard macroeconomic news. The main advantage of using this indicator is to know what to expect and to be able to make a rough plan before the actual macro event starts. You can use this tool for example when you are in a trade, and some macro event is approaching. You can check what the volatility during this event usually is and then decide whether to hold the position through the news or if it is too much a risk and it is better to close the position instead. Based on data from this widget, you can also check how strong any given macro historically was and decide beforehand if some of your levels get hit during the news whether you will take the trades or rather wait for the price to shoot past your level and take a Reversal Trade in the direction of the new trend. Oil news: Those affect the CAD because the Canadian economy (and the strength of CAD) is dependant on the prices of oil which Canada produces. “World economy danger” news: When there is something dangerous happening in the world, it is a known fact that money flows into safe-haven currencies. Such currency is the JPY. In situations like this, the JPY is affected heavily, and it strengthens. Even in cases when Japan is in danger. A good example is a strong tsunami that hit Japan a few years back. As a reaction to this JPY strengthened – despite Japan being the victim! The currency was still considered a safe haven, and it strengthened. So, whenever the JPY spikes and you see news about something dangerous happening in the world (for example North Korea shooting missiles, etc…) then you will be able to make the connection, and you will know it’s best to avoid trading the JPY until the situation calms down. Dairy auction news: This news directly affects NZD because New Zeland’s economy is hugely dependant on exporting milk. When there is Dairy auction macro news, you better avoid trading the NZD. Industrial metals news: If there is significant and surprising news concerning industrial metals (for example steel, copper), then you can expect to see some spike moves on the CAD and the AUD because Canadian and Australian economies are depending on exporting those metals. 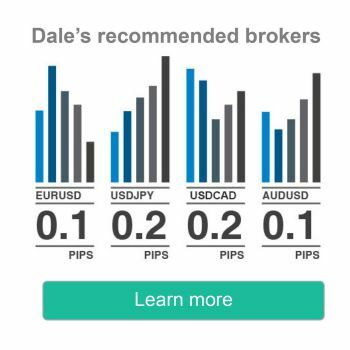 If there is an aggressive, one-sided movement on the AUD or CAD driven by news concerning industrial metals and materials, then it is usually better to avoid trading those currency pairs, or at least be a bit more careful. News concerning a trade partner economy: A good example would be strong news affecting China’s economy. When there is such a news, you can expect the AUD to react. The reason is that China is the biggest trade partner of Australia. Australia exports to China, and if for example, China’s economy slows down, then it means less export of industrial metals from Australia. This is bad news for the Australian economy, and the AUD reacts strongly to such news. So whenever you see strong and surprising news concerning China’s economy, then remember to be careful with your AUD trades. There are more correlations and links like this, but those I mentioned are the most common and affect the forex market, in my opinion, the most. Apart from the fact that it is very difficult or nearly impossible to predict price movement during the news release, also the market conditions are usually against you during significant macroeconomic events. Even if you had a working macro news based strategy, your strike rate would be severely diminished by wide spreads, lack of market liquidity, and slippage. Those are quite common and tightly linked to news releases. It is pretty hard to trade the news when you take your stop loss for example 15 instead of 12 pips or when your spread widens from usual 0.5 to 5 pips. Such conditions literary kill any profitable day trading strategy. So also, for this reason, I decided to stay away from trading the news. BONUS TIP: If I am trading using limit orders (this is around 50% of all the cases) then I simply lower my position size to the minimal size. This way I don’t need to withdraw my limit orders. Worst case scenario – my trading level gets hit, and I lose few cents or a dollar. I switch back to my standard volume size after the macro event has passed. I do this simply to save time because setting new limit orders all the time becomes a bit tedious after some time. I do this with my broker IC markets (cTrader platform). I am not sure if this is also possible to do with the standard MetaTrader 4. I guess you need to have some plugin for that. I prefer to quit my trades around 2-5 minutes before the release (in case of the most significant news for example like Rate Decision even sooner). I usually watch the 1-minute chart to see what is going on with the smaller perspective. 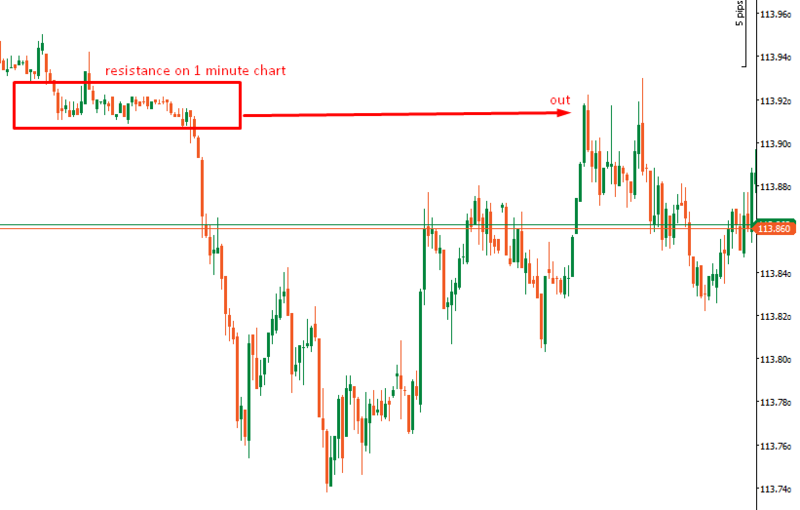 For example, if I see that there is a channel on 1-minute chart, I try to end the trade at the extreme of the channel. In this case, it is not likely that the market will shoot out of the channel before the release. By closing in this manner, I can make the best of the situation I’m given. Sure you can wait and pray, but remember, time is running out, so it’s best to take the first logical exit. 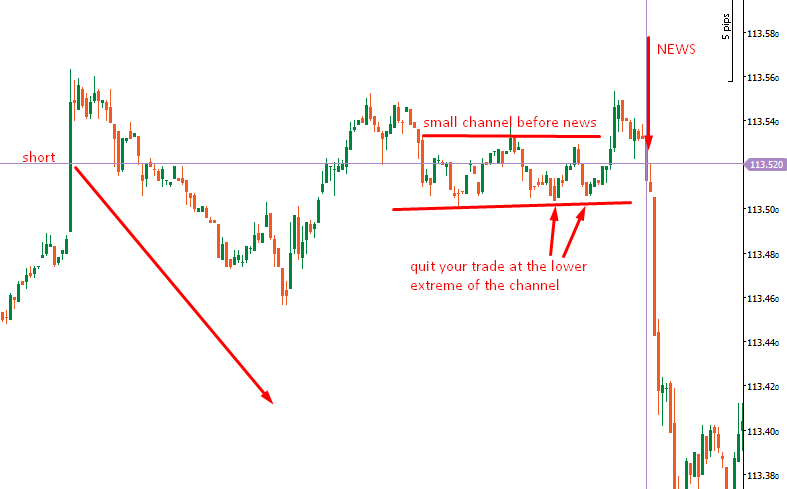 Another example is when the price action doesn’t slow down into a small channel. In this case, I try to exit my position at the closest resistance that I can see on the 1-minute chart. This resistance is usually some type of price rotation (= small volume accumulation area) from which some buying or selling activity started. The general rule to follow is this: start trading again when the post-news volatility has calmed down. However, this can sometimes be a bit hard to tell. What helps me is to first check the type of the macro news. If it is really strong news like Rate decision (or following press conference), NFP, CPI, GDP, then I expect heavy volatility and I am more careful about trading again after the news was released. Also, if such a strong macro event causes a one-sided movement (= strong one-sided uptrend or downtrend), then I am extra careful, and I prefer not to take any trades until I am really sure the markets calmed down. The risk of a strong and aggressive movement pushing past the level is just too big to take, and it is usually better to be safe than sorry. What I prefer in a situation like this is a reversal trade (more about it in tip n.10). If the news is not as significant (for example Building Permits, Oil Inventories, Retail Sales, Unemployment Claims), then I don’t really expect the impact on the markets to be that severe. In such cases, I only wait a bit for the price to calm down and then I am happy to trade again. This can be for example 1-10 minutes. If I quit a trade before news and the news doesn’t cause a significant enough spike to have hit SL or PT, I try to re-enter the position if I get a chance to enter at the same or better price as before. I only re-enter if the volatility has settled down and if the price didn’t go near the profit target (let’s say around 75% or more). I also re-enter only when I still believe it could be a profit. How do I determine this? As an example if I have a level I’m looking to go long from, I want to see a sharp and fast rejection of lower prices (1-minute chart) if I am going to enter my position again. If there is just a weak low and the price only slowly rotates at the reaction point, I am usually a bit hesitant to re-enter, and I may not re-enter it at all. In the two pictures below, you can see a short trade that I quit before the news and re-entered it after it. You can also see the sharp rejection of higher prices that assured me to re-enter the trade. If the reaction to the news (significant ones) is strong and the price shoots quickly and aggressively towards your trading level, then it is better not to stand in the way and rather take a reversal trade. Especially if the news was really strong (NFP, CPI, GDP) and the news outcome surprising. You just need to wait for the price to push past the support/resistance level you wanted to trade and when it comes back to “test” the level from the other side, then you enter your position but in the opposite direction – which is the direction of the new post-macro trend. This way you basically use your trading level to participate in the trend behavior. You only need to adjust your bias and be ready to trade your level from the other side. Such development and reverse tests are sometimes pretty quick, so you need to be fast. That’s it, guys. I hope it wasn’t too overwhelming, but I tried to cover it all and not to omit anything that you could find useful. I am sure that you will be able to implement those tips into your trading quickly and that some of them will become your own and that you will be using them every day. This was a very informative piece. I loved it! Well that was a very useful article. One thing though, I followed the link to the ‘Economic News Impact Tool’ but all I found was the forexpeacearmy forex calendar. I also checked the website’s tools page, still no luck. Maybe they took it down since this article was written. This presentation is for educational purposes only and the opinions expressed are those of the presenter only. All trades presented are NOT TRADED IN A LIVE ACCOUNT and should be considered hypothetical.